I have been doing the Xara Xone for over 15 years and over this period of time I have added a lot of Tips and Tricks for Xara users. In this Workbook I have selected some of my favorites. NOTE: Xara has changed many times since I first started using CorelXARA back in 1996. And during this time a lot of things that were tips are now built in features. And some tips no longer work the way they once did. Such, I’m afraid is life . 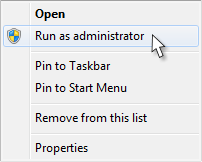 Run as Administrator If you are running Windows 7, and are a new user, quite often selecting the program icon with Xara closed, and selecting Run as Administrator can solve a multitude of problems. You only need to do this once and it will either work or it won’t. But it never hurts to try. Googling Error Messages Nothing is more frustrating than an ominous warning message that pops up in the middle of your project. Sometimes these vexing messages don’t have any effect on the program or your document. But sometimes they do. Trying to find out what the error message means, or what to do about can be equally frustrating. I have discovered is this cool trick. Do a Google Search for the error message. Key it into the Search box exactly as you see it. If you have had this error, many others probably have as well and there is usually a lot of knowledge just a click away. You can also search the Xara Tech Support site, though I don’t find the results as good as a Google Search. One Button Context Sensitive Help If you ever need help with any of Xara tools, quick answers are one button click away. Press the F1 key and a context sensitive menu will pop up with all the options for that specific tool. In the many menus and dialog boxes, such as the Export dialog, press Help for context sensitive help with the options associated with that particular dialog or menu. Xara’s context sensitive help has always been one of my most favorite features. Missing Galleries Department It happens to all of us at one time or another. We press the wrong function key and suddenly one of the galleries drops off the face of the earth. Or at least, off the page. Well, relief is right inside the Utilities drop down menu, under, what else? Galleries. 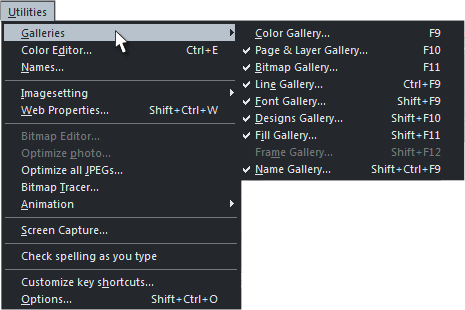 Also included in the fly out menu are the keyboard shortcuts for each gallery. (This is also true of most menu items). So if the Bitmap Gallery has gone missing, click Bitmap Gallery or press F11 and viola!, it’s back. From time to time, one of the control bars on the Infobar may disappear. Who knows how, it just happens. Or maybe you have certain control bars that you just want to go away. In Window > Control Bars you can accomplish these tasks. Check a Control Bar to make it appear or un-check one to make it go away. 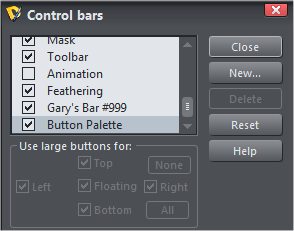 (The control bar, Gary’s Bar #999 is a custom tool bar I created that I use for my favorite functions. It’s called #999 because I have had to reconstruct this bar so many times that it feels like it’s been 999 times). The Use Large Buttons For: options are grayed out for the dark gray (default) program skin. At the very bottom of the list is one called Button Palette. If you press New... you can create your own custom control bar. And you can select your buttons from the Button Palette shown below. 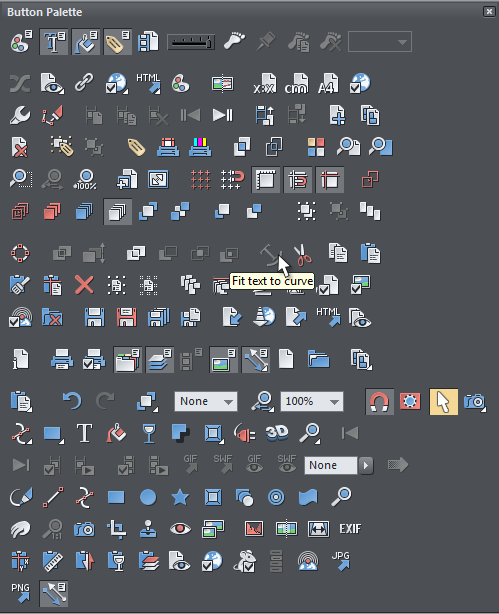 The Button Palette In the Button Palette (Window > Control Bars > Button Palette), is a button for just about every Xara tool and function you can imagine, and perhaps one or two more. If there are any buttons you cannot identify, let your cursor linger over one for a moment and an informative tool tip will appear such as the Fit Text to Curve shown above. To populate your own custom control bar, hold down the Alt key and drag the desired button from the palette and onto your new bar. The bar expands to accommodate new buttons. Hold down the Alt key to drag/rearrange the oder of the buttons. When you’re finished, drag and drop the bar onto the Infobar and it will be there whenever you need it. (Unless you uncheck it in Control Bars). You can create custom Control Bars for several different functions and then make them visible as needed by checking or unchecking them in the Control Bars menu. Have It Your Way You can rearrange the order of the colors on the screen palette of colors. 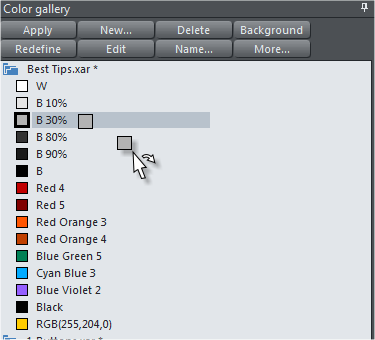 Open then Color Gallery (F9) and drag and drop the colors to a new location. 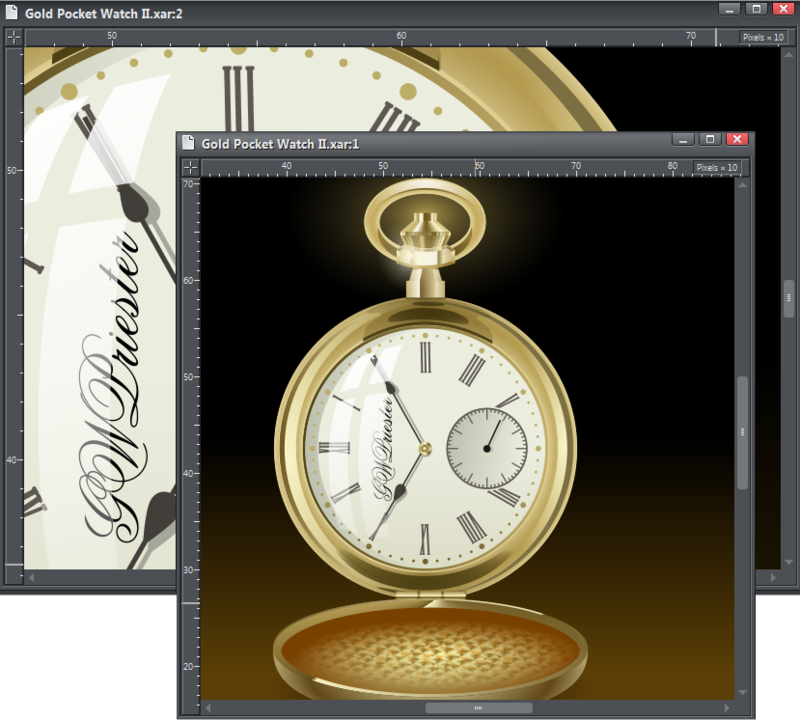 Views If you work on complex images, Views can be very helpful Window > New View. When you select New View, you in essence create a duplicate of your current screen. Except, you can zoom into a portion of the drawing which requires more detail and then toggle between the two, or as many different views as you want by pressing Ctrl + Tab. This lets you work in close and then zoom out to see the entire drawing and then zoom in tight to continue editing. Toggle Between Open Applications A variation of the above is Alt + Tab. This shortcut toggles between open applications.